Supplements – Where You Could be Wasting Your Money! If you are into fitness, particularly with respect to developing your physique, you probably spend a lot of hard earned money along the way- Be it on food, gym fees or on the wide range of supplements that are available to us. The supplement companies fuel the fitness industry, without it the professional fitness competitors would struggle to make a living, magazines and websites would struggle to survive and we would not see the great shows and expositions that allow us to see our favourite athletes as well as provide us with a great source of motivation. However, like any big business, the main concern of any supplement company is profit. Whether it is the great sums of money they invest in advertising, or through social media and the athletes they bring on board, their investments are made for the sole purpose of improving their bottom line profit. Whilst there are some great products out there that will certainly help you progress your physique with the right diet and training plan in place, there are many that are simply not worth spending your hard earned cash on. Even of the supplements that do provide us with a useful tool, they are often relied upon too heavily! This in a large part is the result of the marketing either directly by the supplement companies or the athletes they endorse. I will often post a client’s transformation picture and receive comments asking what protein they are using, what supplements they are using etc and often more questions are asked relating to this than their actual diet and training! Let me get one thing clear before I continue, however much you invest in supplements, they will not have a noticeable impact on your physique if you are not progressing first through diet and training alone! Whenever I take on a new client, I ask what supplements they are currently using and am often amazed by the huge list that they give me! We have all been there. In my early years I too would waste a lot of money on supplements which I thought were going to give that 10lb of muscle in 2 months, being sucked in by the clever marketing. Of course at the time I knew no better, they guy in the advert uses it right? It must work! Of course though, that guy in the advert looked like that due to genetics combined with years of hard work, a look he had well before he even signed with that particular supplement company. I have talked about whey protein a lot in the past and as this is one supplement that really is worth investing in I will only cover this briefly. When I say it is worth investing in I mean investing in quality whey as opposed to cheaper options. If you can get all the protein you need in your diet through food sources alone you really are not going to gain any huge benefit by throwing whey protein into the mix. It should be looked at not so much as a supplement but as another protein source in your diet. Used in combination with food sources to make up the total protein content of your diet, it provides an option which is both easy to consume and rapidly digesting. However, as we are seeing more and more, there is a huge variation in quality! You may think you are saving money investing in a cheaper product yet when you do your research on amino spiking and how accurate brands actually are with respect to the nutritional information on their products labels you will see that quality here is important. Even a top end whey protein isolate will still be a cheaper protein source gram for gram than even chicken or tuna so is well worth the investment. BCAA’s are useful as they can be absorbed directly into the bloodstream without need for digestion and the amino acid Leucine is also directly responsible for triggering protein synthesis. Without going into too much detail, this can help reduce catabolism during training and also during cardio - it can help increase the rate of protein synthesis with respect to the rate of protein breakdown. To trigger the protein synthesis process it has been shown that a dose of 2.5-3g leucine is needed, any less than that will not stimulate the mTOR molecule and is therefore ineffective. In a 2:1:1 ratio standard BCAA product this means you will need to take a serving of at least 5g for it to have any effect. However, supplement companies are well aware that the general public know that BCAA’s give this benefit, but also how many people actually know or even care how or why they do this. They also know that most people will prefer the convenience of taking tablets over a powder and as a result BCAA capsules are extremely popular. However, 1 BCAA capsule will typically provide 250mg leucine. We already know that we need at least 2.5g leucine for these to have any affect so do the maths – that is 10 capsules in a serving for the product to have any effect! 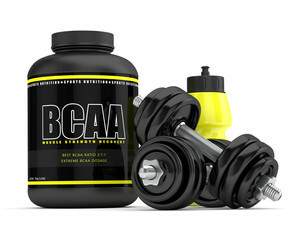 Like BCAA’s creatine is a useful product, but it is also one where I see a lot of people wasting their money. Today, there is a wide range of creatine products available and again this is all about the supplement companies making money. Firstly, it is important to understand why we would use creatine. When we train at high intensities creatine phosphate is used as a primary energy source and one that will be used up very quickly. For many people, supplementing with creatine will help them to saturate their creatine stores. In which case, they will benefit from the product with increased strength and strength endurance. There are though, some of us whose stores may already be saturated due largely to the diet and also our own individual saturation level. In result, the only way to see if you will benefit from creatine is to try it! Of all the products mentioned this is the one that has the potential for consumers to waste the most amount of money. When I was in my first few years of training I too would throw in supplements such as tribulus and then various test boosters from different brands after the marketing of the products showed so much promise. I remember one such product that cost around £60 for a months supply, the adverts were great, athletes I respected were sponsored by the company and I later became one of those. I remember reading one of the testimonials in which a claim was made to have added 10lb of muscle in a 4 month period with this product. Of course when I tried it myself I noticed no noticeable increase at all. What we don’t see is that if someone did indeed manage to add that much muscle in that time period then it was more likely down to the fact that their training and diet had changed rapidly in conjunction with taking the product. But even more likely is that the testimonial was not even true! As I said, I later became one of that companies athletes and one of the reasons I left was that I saw them put out a post, with my picture and a testimonial apparently by me (they even used quotation marks!) talking about a product that I had not only never provided a testimonial for, but had never even used! Most of the ingredients in test boosters or standalone supplements such as tribulus, DAA, horny goat weed, ZMA etc have research for and against increasing testosterone levels. What we have to consider with a lot of the research though is the other factors applied to groups such as training and diet. It is pretty expected that an untrained individuals testosterone levels will increase with the commencement of an intense weight training programme and a good diet which is far more likely to be the cause of any positive effects than the tested supplement. Also, tests may then be applied to test levels post training which will naturally be spiked and have no bearing on the resting test levels. Even if a particular product does lead to a slight increase in testosterone levels, it is very unlikely that the increase will be enough to have any noticeable effect on muscle growth. There may be a benefit if someone is in a low range naturally and a booster helps lift them just into a low/average range, or from an average range to an average/high range and that ties in with what I have seen myself. With research here often showing promise, but then products shown to be ineffective in other studies my best judge here is to combine the research with experience. Experience of my own, with clients and from other coaches and industry experts. I won’t say that I have never seen a testosterone booster to have a positive effect, because I have. But those incidents are few and far between. I have seen clients experience benefit, and when I say benefit I am not talking anything like 10lb of muscle in 6 months, but then those same products have had no effect on others. I believe that if one ingredient helps a particular person in a particular part of the testosterone production process they may experience some small benefit. But what product and what individual you will not know until it happens and that may cost them a lot of money in the process!! Especially considering that most people will not receive any benefit from any natural testosterone booster. So this is normally the answer I give to clients, when they want to try something I make sure they know it is extremely unlikely that they will experience any benefit at all but if they want to try it they can as I have seen incidence in the past where a very slight benefit is noted. But for the price of the products and the likelihood that any one product will have any effect at all I would still put these supplements in the do not waste your money bracket. If you want to boost your testosterone levels, get more sleep, eat right and train hard! N.B. I have also in the past been asked about pro-hormones. These are quite different as they are not “natural testosterone boosters”, they are in fact legal steroids. The reason these are legal is that the exact molecule in the product is not yet added to any FDA banned substance list, but usually they are at a later date hence why these products are constantly being banned and then new ones brought to market. The main reason here is that back in the 1930’s and 40’s when anabolic steroids where being developed is that there were 1000’s of different types created and tested. Those that had the right balance of safety and effectiveness were then mass produced and what became the anabolic steroids available today. At the time the others were disguarded either as they were not very effective or due to the risk implications being much higher. Those products though, as never mass produced were not banned by the FDA, and are now resurfacing in the form of pro-hormones. So whilst pro-hormones may help with respect to improving hormone levels for muscle building and fat loss, they are not only less effective but also more toxic than anabolic steroids themselves!